Ticket’s for Michigan Haunted Houses! BOX OFFICE OPENS at 8:00 p.m. and Closes at 11:00 p.m. on Dates of Operation. Need a ticket to our haunted house that’s located in Jonesville, Michigan? You can buy Halloween Haunt Attraction tickets at our ticket booth , located near the haunted house. Be sure to look for discount coupons at local Michigan merchants. 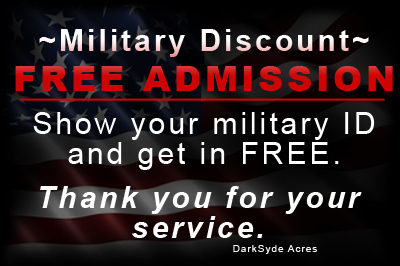 DarkSyde is Keeping our ticket pricing simple ~ $22.00 gains you access to all 5 Attractions. We are offering more scares for your dollars than ever before.